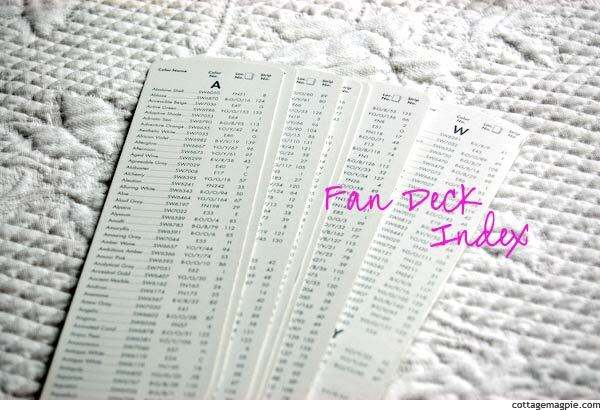 If you've been knocking around decorating blogs long, you might have heard the term "fan deck" thrown around. I'm sure many of you already know what that is, but in case you don't, here's a quick explanation. Every paint manufacturer has a set number of pre-designed colors that they've created, which you usually see arrayed in rows at the paint store on paint chips. Well, you can also take the whole display home with you in a convenient little book called a "fan deck." 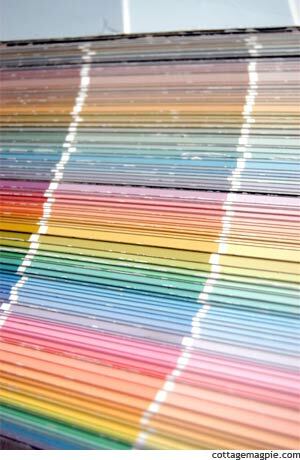 Simply put, a fan deck is a collection of all the paint chips from a particular manufacturer or designer. Fan decks are great because not only can you look for colors without having to make a trip to the paint store, you can look at the colors in the natural light of the room. Plus, now when a blogger mentions a paint color, you can whip out your trusty fan deck and look it up! Fun! So, let's say you were looking for a specific color, like Comfort Gray. 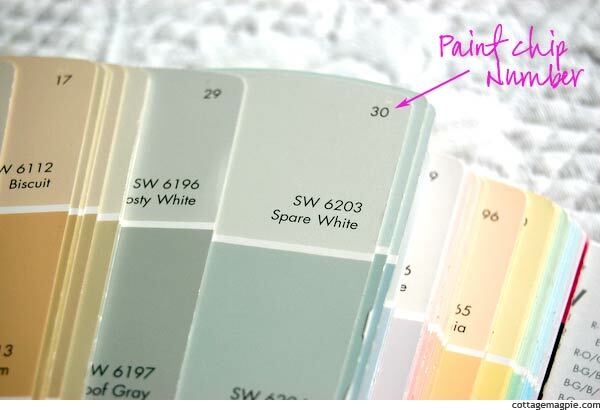 You would look through the index until you found "Comfort Gray" and then you would see that it was on paint chip number 30. And look down the strip to find the paint color you're looking for, in this case, "Comfort Gray." Isn't that cool? Can you possibly imagine how you lived without fan decks? I can't. Mine is never further away than arm's reach. It's possible I'm a little obsessive about paint colors, but then, aren't we all? P.S. As for where to get them, it depends on the company. Some of them are available online, and some you have to go to the store directly. The Restoration Hardware fan deck I got by calling the store and asking for it. They charged me $10 and shipped it to me no problem. The Sherwin-Williams deck I bought at my local store. When the clerk asked me if I was a professional decorator, I said, "No, I write about interior decorating online," which is what I usually say since so many people still don't know what a "blog" is. I'm not sure it was important, I thought he was just making conversation, but someone has since told me that the fan decks are for "professionals only," so maybe writing counts. Anyway, I paid $30 for it.